There’s a lot of talk these days singing the praises of Social Media Marketing, Content Marketing, and a host of online / internet technology-based marketing strategies. This may well be the most POWERFUL form of marketing on the planet. However, most energy auditors and home performance businesses have almost no plan or system in place to make these happen on a regular basis. Referrals should be in every energy auditors and home performance contractors marketing arsenal because referrals are the least marketing expense with the largest ROI to gain new business. Compared to the usually high cost of acquiring a new customer, there's a much lower cost of acquisition with a referral, because they find you; you don't have to go prospecting for them. 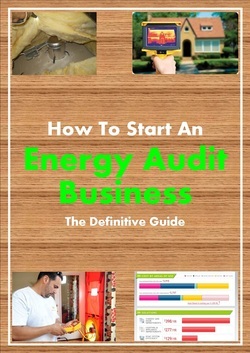 Energy auditors and home performance contractors are well positioned to be the home-heroes to our customers. There's no doubt in my mind about that. I've seen it time and time again, and it's added to my bank account time and time again. While incredible customer service goes a long way in generating referrals, you don't have to leave them to chance. A formal customer referral program can really be one of your greatest marketing tools. In fact, my home performance business has reliably generated two new referrals every week. Save you time on marketing. Referral strategies - once established - don't require much management or time investment. Improve your credibility. Your customer's networks likely overlap, and create potential for a single customer to be referred by two people. This encourages the perception that your business is "the place to go." Increase your qualified leads. Your customer arrives with an assumption of trust, and willing to purchase. Boost your profit. You will spend less time and money generating leads, and more time serving customers who have their wallets open. ​Speed the sales process. You will have existing common ground and a reputation with the referred customer. I know you are asked like we are everyday to give energy savings guarantees from customers, well this is our guarantee for you, the hard-working energy auditor and home performance contractor. Our program has been so successful and repeatable even our admin staff can run campaigns on autopilot and bring in high quality leads. If you go through the program and implement the strategies we give you we guarantee your satisfaction. If you complete the campaigns and have not generated one referral in one year, just send us your work as proof you tried and we will refund your money, simple as that. You are an energy auditor or home performance contractor looking to grow your business and expand by adding a solid referral campaign to your existing marketing campaigns. You are frustrated with weak marketing campaigns that are lucky to even break even. Understand exactly what your referral campaigns require to be successful. How to ask for referrals in a way that’s totally “under the radar” – no one will ever have a clue that you’re even asking them to refer you! Ready to use swipe and deploy campaigns to use in your business right away. Scripts and templates for your auditors, sales staff and admin answering the phones to generate referrals. Our own Test Out Party files ready for swipe and deploy campaigns to use in your business right away. Scripts, templates and example ads to generate referrals. ​Best practice strategies for engaging realtors, window contractors and solar companies to create an army businesses sending you customers. Scripts and templates get in front of potential partners and irresistible offers.